Celebrate the life of Elvis Presley with these unique playing cards. Original photographs from early in his life through the later years, this deck pays tribute to the man who is now a legend. Suitable for all card games and a terrific gift for fans and collectors. Alfred Wertheimer’s photographs of a young Elvis Presley represent a unique collection of candid images. Documenting Elvis’s tremendous charisma and dedication to his music, this deck of standard playing cards includes 54 of these one-of-a-kind-photos. 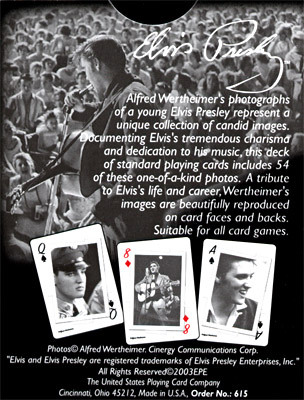 A tribute to Elvis’s life and career, Wertheimer’s images are beautifully reproduced on card faces and backs. Suitable for all card games. Specify which deck you'd like when ordering. 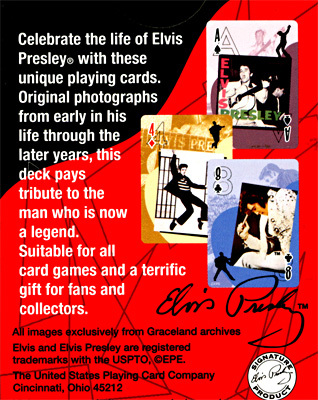 Simply enter your details below and we will send you an e-mail when “Cards Elvis Presley” is available to ship!